Many of this year’s biggest music festivals and concert tours impressed the crowds with converging broadcast and AV technologies. Among the companies on the leading edge: Blackmagic Design. The company recently provided a look at how its AV solutions, from cameras to switching, routing and monitoring, have helped rental and staging companies bring the art of live video production to new levels. 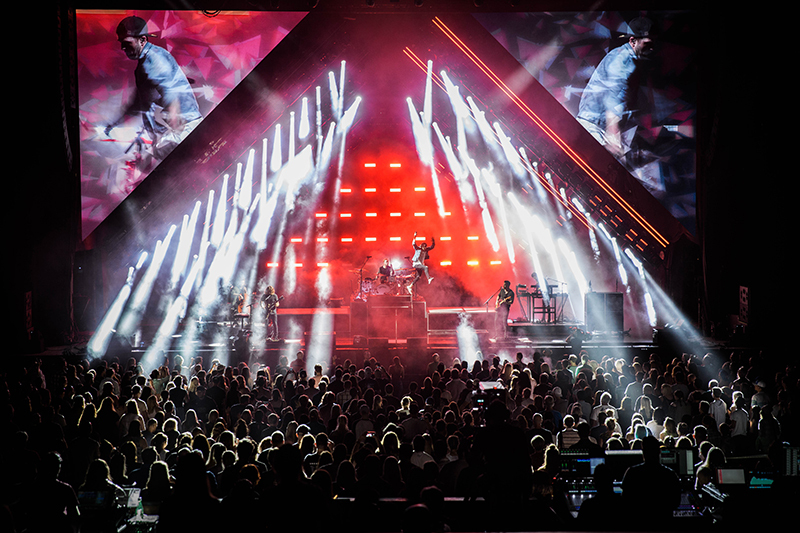 Stuart Merser, live video director and owner of Vis-a-Vis Media, teamed up with Jeff Nolte of OCD Labs to design and specify the video rack used to support OneRepublic’s headlining slot on the 16th annual Honda Civic Tour (See related story, PLSN, Sept. 2017, page 30). The setup made use of switching, routing and monitoring hardware from Blackmagic Design, with an eye toward create unique live video manipulation of the band’s performances, including touring, festival appearances and corporate commitments. “The rack is designed to be powerful but portable,” says Merser, of the setup that included Blackmagic Design’s ATEM 2 M/E Broadcast Studio 4K, Teranex Express and HyperDeck Studio Mini. The rack was used for the band’s U.S. tour leg, which ran from July 7 to Sept. 12, with more shows in Asia from Sept. 15-27. Content for supporting acts James Arthur, as well as Fitz and the Tantrums, was produced on a supporting ATEM 2 M/E Production Studio 4K. Three cameras, one 86x at front of house (FOH) and two wide angle 14:4:3 cameras in the pit, captured the action, while four micro cameras were positioned onstage for fixed close-ups of drums, cello, piano and synths. All seven channels were routed to the switcher and several media servers as well as to a live video manipulation engine, VideoDust, to create stunning graphics from the live inputs. “VideoDust is, in fact, built on Blackmagic capture and playback cards,” Merser noted. Signals to the tour’s triangular LED screens, as well as monitors backstage and FOH, were distributed using a Smart Videohub 40×40, with the video rack’s Teranex Express standards converters playing a key role. Other acts and festivals, including Jimmy Buffett, Train and Elton John as well as La Route du Rock, BigCityBeats and Reggae Fest, also relied on new AV technologies this year. Video production companies adding Blackmagic Design solutions to their tool box for this year’s shows include PRG XL Video, Lang AG, Fix8 Group, So Midwest, VPS Media GmbH, Subtractive Inc., and Creative Technology. Production company So Midwest recently used Blackmagic Design’s Teranex AV, SmartView Duo and HyperDeck Studio Pro on Train’s “Play That Song” 2017 tour. So Midwest is also using a full Blackmagic Design workflow on Fall Out Boy’s “Mania” tour (See story, page 78). The gear list includes Blackmagic’s Studio Camera 4K, URSA Mini Pro and Micro Studio Cameras for live shots, as well as video racks for I-Mag that include ATEM 2 M/E Production Studio 4K, ATEM 2 M/E Broadcast Panel, HyperDeck Studio Pro, Teranex Express, Teranex Mini, Multiview 4, SmartView 4K, SmartScope Duo, ATEM Talkback Converters, UltraScope and various Mini Converters. VPS Media GmbH, who provide live production services for BigCityBeats throughout Europe on the World Club Dome electronic dance music events also believes that Blackmagic Design’ product range offers them total flexibility thanks to is use of open interface.